The first half of pregnancy can be made a little more tiresome by the not quite prominent enough ball you're carrying at your waistline. 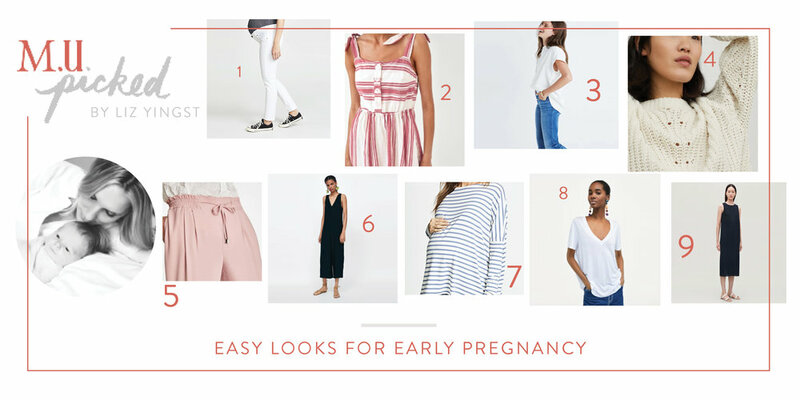 Until my bump was looking more obviously a baby as opposed to an extra taco at lunchtime, I was avoiding anything on the tight side and leaning into a bit of slouch and give in any pants and tops. Lucky for me, Liz Yingst, our guest style editor and a NYC based stylist has a special interest and service for maternity and post-partum wardrobe editing. She compiled her list of easy, affordable and dependable looks to reach for when you're at a loss in these early weeks. You can browse Liz's list below or in the MU·Picked shop where we gather all our favorites for balanced living in motherhood. These Paige Skyline Maternity Jeans fit beautifully and are low and discreet with an extra bit of fabric to make room for your expanding belly. This Zara strappy stripe dress has an elasticized waist and back which can flatter a bigger bump or hide what you'd like in the early, early weeks. An oversized button down is always an easy option but I like the Central Shirt from Madewell as a more feminine, softer option. Neha lives in this H&M Knit Chenille Sweater right now and the chunky knit and boxy fit work nicely as an extra layer for maternity wear. I'd suggest stocking up because of the price point and quality. I love these joggers from Zara that come in various colors, can be worn with a heel or sandals, paired with blouses or sweatshirts but most importantly ride a little low under your growing bump. These wide strap jumpsuits are always a good choice and the midi cut is on trend but the fit is forgiving, as is the price point. Neha swears by the Marni jumpsuit by Loyal Hana which will serve you well post-partum as it's designed for maternity and nursing. I still wear my HATCH long sleeve tees post-pregnancy but they have loads of room and swing to last you all ten months of maternity needs. These basic loose fitting tees are drapey and soft making them an essential in all the neutrals to throw on with well fitting jeans. COS only recently came to the states but they're well loved for their streamlined collection and this V-Back Sleeveless dress has a nice length that can be dressed up or down and a straight cut that flatters your top half. Written by Liz Yingst, a New York-based mother, fashion buyer & stylist, and contributor to the MU community. See more of her picks here, here, hereand here. Featured Image of the H&M Knit Chenille Sweater via H&M.